Left: Greenland in 1999. 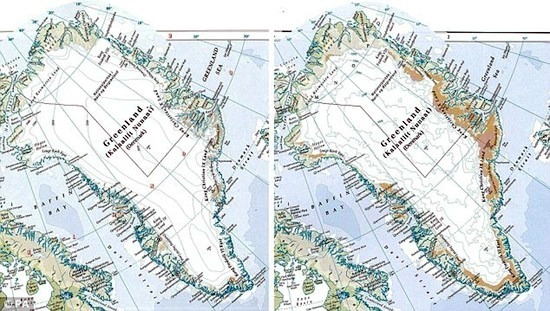 Right: Greenland in 2011. Credit: The Times Comprehensive Atlas of the World. UPDATE: I’ve updated this story in a new blog post here. The breaking up of the Antarctica ice shelves: The atlas’s new Antarctica image shows the breaking up of the Larsen B ice shelf and Wilkins ice shelf, along with the ice bridge that once joined it to Charcot Island. The shrinking of seas and lakes: The level of the Dead Sea has dropped 40 feet/12 meters in the last 12 years, mainly due to draining water from the Sea of Galilee and diverting it to the Jordan River. The Aral Sea, which has shrunk by 75 percent since 1967. The drying of rivers. Most years the Colorado River never reaches the Gulf of California due to damming, irrigation, evaporation, and water diversion to Salt Lake City and Los Angeles. In Mongolia, the Ongyin Gol river is diverted for gold mining. These and other rivers shown as ‘intermittent’ on the latest atlas could dry up entirely by the next edition in 2015.